MICROSCOPY UK / MICSCAPE - Taking a photomicrograph .... in 1904. Photomicrography. In these days of modern microscopes with flat field objectives, quartz halogen illumination, electronic exposure determination and sensitive film emulsions, spare a thought for the microscopist a hundred years ago striving to take a good photomicrograph. Despite the difficulties, the early workers often achieved quite remarkable results. Perhaps there are parallels with the photographers of that era. The quality of many of the early landscape and portrait photographs both technically and artistically are still very much admired today. Like the photographers, the photomicrographers of that era knew how to get the most out of the equipment and materials at their disposal. A book that demonstrates this extremely well is 'Nature Through Microscope and Camera' by Richard Kerr with photomicrographs by Arthur E. Smith. This fascinating book published in 1905 often crops up in the second-hand bookshops and is worth looking out for. The picture below shows a photomicrograph, and I hope you'll agree that given that the scan is from a 92 year old book illustration (Fig. 3 from this book) not the original photo', it is a photomicrograph that would be more than acceptable if it had been taken on a modern microscope (some distortion has occurred in scanning). 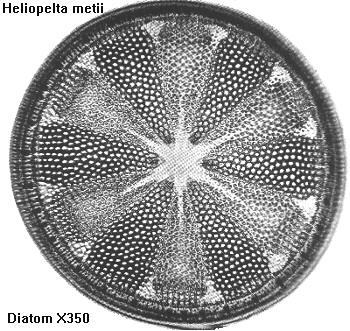 The book includes photomicrographs taken at a wide range of magnifications, including the detail of diatoms at 1750X and 'macro' shots of beautifully laid out whole insects at 8X. The photograph of this equipment makes me smile every time I see it. They don't make them like that anymore! You can just about see the piece of string the user is holding to adjust the focus on the microscope. The photomicrographer Arthur Smith mentions that the impressive bellows extension was required to project the image onto the large 12 x 10 inch photographic plates. Mr Smith also stressed that achromatic objectives were used for all the book plates and no retouching of the negatives was carried out. Although the higher quality apochromatic objectives were certainly available at the turn of the century, they would have been very expensive for the average amateur. The author was keen to demonstrate what could be achieved by getting the most out of modest optics. He apparently avoided the temptation to use the most intense sources of illumination available at that time, namely 'oxy-hydrogen lime-light' or 'electric light'. Presumably the illumination was a more conventional gas lighting, and exposures were stated to be between two seconds and two hours or longer. Coloured filters to control the contrast on some subjects were also employed. As an aside, Richard Kerr the author of the book described above, adopts a somewhat moral tone in the introduction which was often the case in books of this era. However, in these days of instant entertainment with TV, computer games and amusement arcades maybe his remarks still provide food for thought! As a final thought, what will writers a hundred years from now think of our photomicrography techniques? Silver based image recording is already being replaced by digital techniques, and although a photomicrographer from 1900 would probably recognise with guidance many of the features of a modern photomicroscope, would we recognise the equipment used to take images of microscopical images in 2097. Who knows?! 1) 'Nature Through Microscope and Camera' by Richard Kerr with photomicrographs by Arthur E. Smith. Published by The Religous Tract Society, London 1905. 2) 'Recording the image - past and present' by S. Bradbury. Quekett Journal of Microscopy, 1994, Volume 37 (part 4), pp. 281 - 295. A well illustrated historical overview of image recording techniques including photomicrography. 3) 'The Microscope Past and Present' by Savile Bradbury. Pergamon Press, London, 1968. A concise discussion of the history and development of the microscope. Comments to the author sent via our contacts page quoting page url plus : ('dwalker','')">Comments to the author welcomed.